Not only the stamps, but also the booklet covers and inserts are good items for thematic exhibits. Thus, we can expand the collection with some booklets that do not contain scout stamps. Great Britain issued in 1969 a booklet with definitive stamps. Between the blocks of 6 stamps are inserts on thin paper with various advertisements. One of these has an advertisement from The Scout Association, it shows the British boy scout badge and an invitation to support scouting financially. The illustration shows the booklet insert and the stamps that are affixed in the booklet immediately behind this insert. The booklet cover has no connection to scouting. Great Britain has many similar booklets with inserts that fits nicely in various thematic collections, but this is the only that is related to scouting. 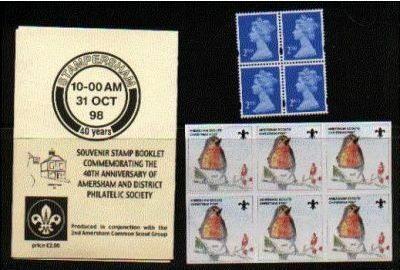 QEII Stamp booklet issued by the Amersham & District Philatelic Society on the 31st October 1998. 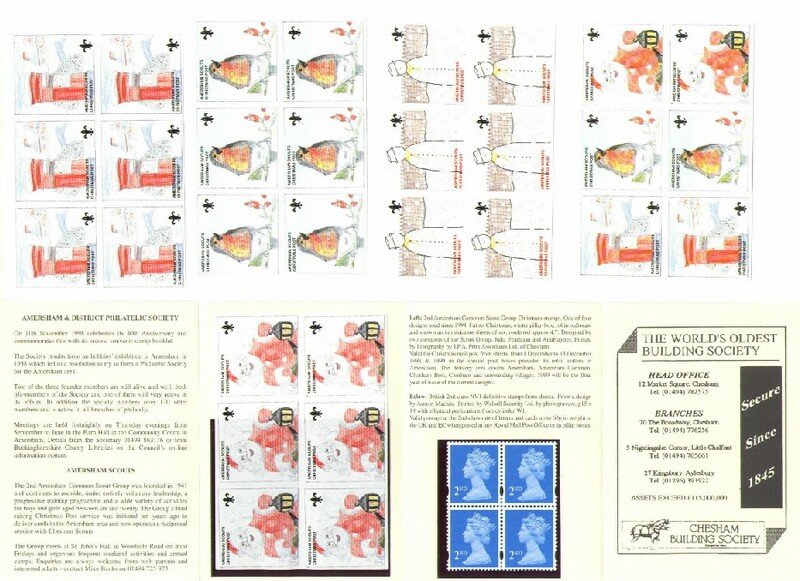 There were five booklets in all each containing four 2nd class GB stamps (from the Walsall printing cylinder W1) and one of the sheetlets of the Amersham Scout's Christmas stamps from the past five years (four separate designs and a composite sheet of the four designs). There were a total of 100 booklets of each design (500 in all). There was also a souvenir cover, 100 in black-and-white and 100 in colour. 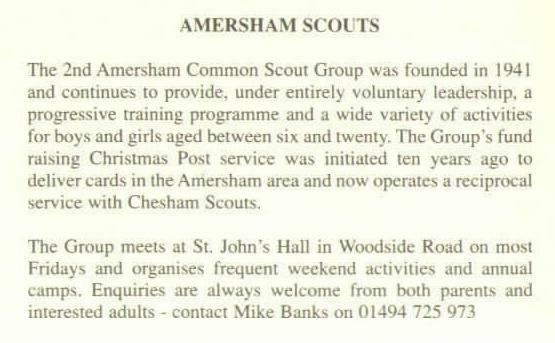 The booklets were produced to commemorate Amersham Philatelic Society's 40th Anniversary and, since the event was at the time when the Scout stamps would be about to go onto sale for the Christmas Post that year the Scouts and the Society collaborated to produce a joint booklet to promote both organisations. Descriptive text from the inside of the booklet cover.